If you know me, you will be aware that I love organizing! I'm kind of a geek that way and I'm always looking for new ways to optimize the way I store things. So I figured when I picked up these books that I would find out my systems were good and get a few ideas for some tweaks. I wasn't prepared for the "life-changing" magic and a whole different viewpoint on being organized! 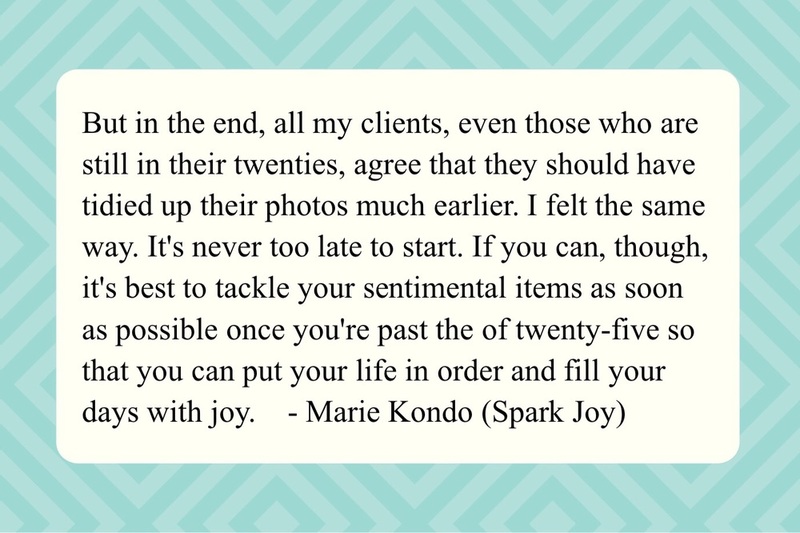 These books (The Life Changing Magic of Tidying Up and Spark Joy) are written by Marie Kondo, a Japanese woman who has made a very successful career out of encouraging people to declutter their homes. Some of her concepts would apply more to someone living in Japan, but most of them are very universal. I've seen online references to the KonMari Method and figured it was just encouraging people to throw everything out. She does advocate some pretty radical ideas for paring down your belongings, but she also very much believes in keeping the things that bring you joy. I actually enjoyed the second book even more than the first one, but you do need to read both to get the full idea. I guess I liked the Spark Joy book a little more because it had diagrams and more concrete examples of how to accomplish the KonMari method of decluttering. The most interesting parts of both books for me were the small sections on sorting through your photos and memorabilia. I always seem to look at things through the lens of a memory keeper and I thought she shared some really important ideas relating to what we keep. Even a decluttering professional respects and encourages meaningful memory keeping. Our photos are often great sources of joy. I don't know about you, but I'm well past the magical age of 25 that she states is the cue to get your memories organized. Remember, it's never too late to start though!